The King Cole Restaurant French Dressing is a homemade dressing that will bring back great memories if you were lucky to live in the Dayton, Ohio area. It’s hard to beat this creamy French salad dressing. ing Cole Restaurant French Dressing is a smooth creamy dressing for any occasion. Not too sweet, not to tangy! This recipe was given to me by a former cook at the famous King Cole Restaurant in Dayton, Ohio and is authentic. The King Cole Restaurant located in Dayton, Ohio, was located in the Kettering Tower. Was known for its amazing steaks, seafood, and it’s high-end white glove service. This restaurant had its heyday in the 1970s and the 1980s. While you can’t go there anymore, you can enjoy one of their salad dressings thanks to a fellow viewer to says she got the recipe from the chef. So you can enjoy this homemade french salad dressing. This french salad dressing is unique, as it is made much like mayonnaise, you will be blending together a wonderfully seasoned ketchup base with an egg, and you will prepare this with a blender, and emulsify the dressing by drizzling in oil. The egg and the oil emulsify to make one amazing salad dressing that is so creamy. This recipe does use a raw egg in its preparation. If you are concerned about the raw egg you can use a quarter cup of egg beaters, or a pasteurized egg. Many older salad dressing recipes are made with raw eggs. You may wonder how long you can store this salad dressing. You can store this salad dressing for up to 3 days. You must keep this salad dressing refrigerated as it is homemade and it does contain an egg. Looking for more great homemade salad dressings? Enjoy this creamy French salad dressing, you won’t believe how good a homemade dressing can taste. Preparation: Mix all ingredients except salad oil in a blender. With motor running, drizzle the salad oil in in a steady stream. Blend until emulsified. I really liked this French Salad dressing. I am looking for a recipe for the King Cole’s meatballs. Does anyone know where I could find it? The King Cole was an elegant place that my parents would take me once a year around Christmas. It was the first time I experienced fried lobster. Wow, did I think I was special. Don’t remember this salad dressing but we are going to try it and tip a glass to a lost restaurant great memory. What type of vinegar did you use? Apple cider? White? Wine? Thanks! Can’t wait to try this dressing. 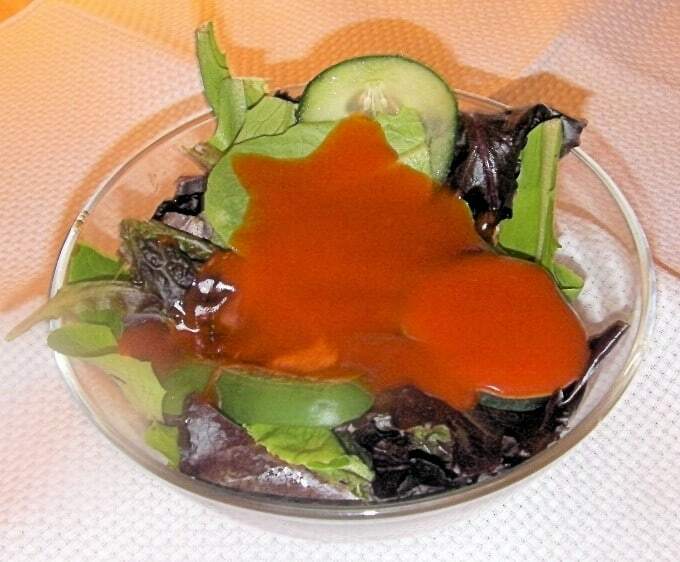 I like the color of this dressing. The recipe has a kind of retro feel to it, no? You are right. I hadn’t thought about it that way.